Why Did The Horse Run Into The Bar? 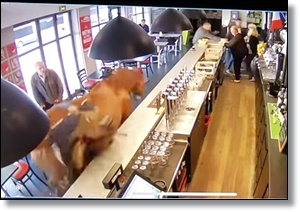 A young horse who escaped her handler in France did not give customers at a nearby bar a good punchline, but she did give them quite the scare. Guest saw the horse approaching the establishment but did not expect the animal to come through the door. When she did the patrons were shocked. Security footage captured the moment that drinkers had to flee in a panic as the horse burst into the bar. The horse's trainer, Jean-Marie Beguigne, said the horse had dumped her rider at the Chantilly race course stables, less than a mile away, and made a run for it. Mr. Beguigne said the horse had a tendency of trying to escape but said it was “exceptional” that it had made it as far as the bar. While the horse’s bar visit happened last month, video of the equine encounter quickly went viral after appearing online this week. “There was quite a panic. I still can’t quite believe it happened,” said the owner, Stephanie Jasmin. There were no injuries and the horse showed no signs of anxiety or trauma.